Costing £60 million and measuring 85 metres (265 ft) in height, Obel dominates the Belfast skyline. 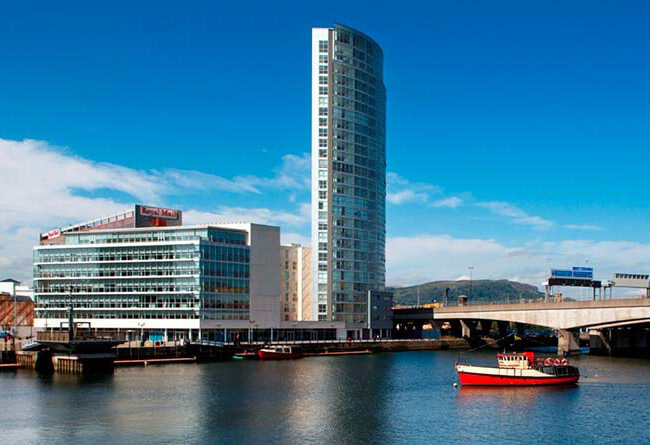 It has overtaken the current tallest skyscraper in Ireland which is Windsor House (80m) and is also in Belfast. Obel was developed by the Karl Group and is located on Donegal Quay on the river Lagan beside the Lagan Weir. The development consists of 282 luxury apartments and this ultra modern construction has two underground car parks and commercial and retail space in development. Blackbourne Integrated M&E is the electrical and mechanical contractor responsible for all aspects of management of the buildings and facilities at Obel. 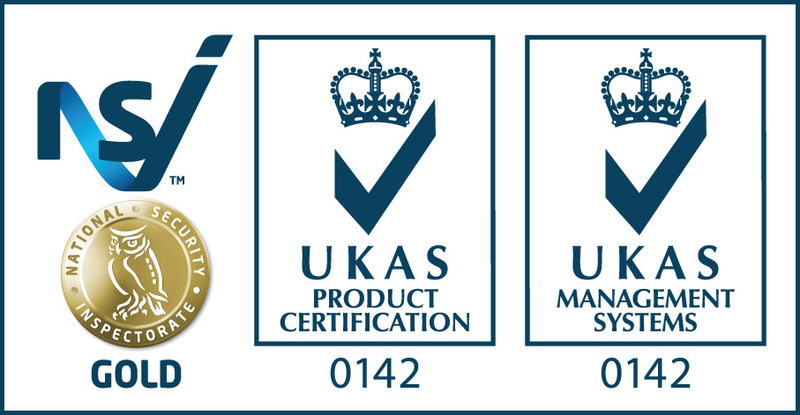 Building Protection Systems (BPS) based in Belfast is the security installer for the project and specialises in the specification, installation and maintenance of security, video, access, fire and intrusion systems. Karl Group, the company that owns Obel, has an obligation to provide safe and secure parking for residents. As an exclusive address in the heart of Belfast, residents expect their cars to be monitored and for thieves or vandals to be deterred from any illegal activity. Equally residents expect the entrance and central lobby area of the tower to be monitored closely to prevent intruders and unwanted guests from entering the building. For the Obel project, Blackbourne required a cost effective CCTV solution with the capacity to record and store surveillance footage to provide 24/7 video monitoring of the underground car parks and lobby area of the building. Part of the requirement was for the cameras to be vandal resistant and able to withstand the damp environment of the underground car park as it is very close to the river Lagan. BPS turned to Honeywell to deliver the right product mix for this project. As a market leader in video surveillance, CCTV and digital video recording solutions, Honeywell provided the right equipment to meet the clients’ requirements. With the requirements clearly defined, Honeywell was able to provide the cost effective solution specified by BPS and Blackbourne Integrated M&E. Resistant to attack whilst having an environmentally suitable housing. Delivers high quality pictures and resolution. Cameras are able to withstand the rigors of the car park environment – damp, cold, moist and low light conditions. The HD4CHX provides a camera and lens as a single, vandal resistant, compact unit that is easy to install. The rugged scratch- resistant 3.5 mm thick polycarbonate construction can withstand heavy external impacts. In addition, the housing incorporates a new vent that prevents any condensation from forming inside the housing. This innovative camera, with waterproof properties, meets IP66 standards for critical outdoor installations. Three Honeywell HD3 Series colour mini domes are deployed in the lobby area of the building to monitor people entering the building and lift usage. Captures clear, crisp video and improves recorded video quality when used with a digital recorder. Tamper resistant housing protects the camera and cabling. The HD3 is a camera and lens unit integrated as a one-piece, tamper proof and compact unit that can be surface or flush mounted for fast and easy installation. It is attractive and unobtrusive yet provides a crime-deterring presence around-the- clock with its excellent low light imaging protection. Two Honeywell 16 Channel 1Tb HRDPX Performance Digital Video Recorders (DVRs) have been installed to record and store the video footage from the domes in the car park and the lobby. They are monitored onsite by a dedicated operator. Two Honeywell HMLCD 19x LX monitors have been installed to view the stream of footage collected from the DVRs. The highly cost effective HRDPX16 Performance Series DVR offers a high image per second (IPS) recording rate combined with a feature set comparable to many high-end embedded DVRs. The HRDPX16 supports continuous, event and combined continuous/event recording and is configurable per channel. Upon detection of motion, the HRDPX can automatically boost the images per second recording rate to capture additional details of the scene. This is a vital feature of the DVR in aiding the production of video evidence. Once video evidence is located on the HRDPX16, the user can save video clips to the PC and/or to portable media such as a USB stick using remote software. For example, if an incident occurs that requires police intervention video evidence is quickly and easily extracted from the DVR. In addition to recording at a rate of up to 400 IPS PAL, the HRDPX16 supports high-end capabilities such as a user-friendly front panel control, mouse operation, infra red remote control, express search to quickly find video evidence, an internal DVD-RW and two USB ports for copying evidence to portable media. Honeywell’s HMLCD19LX LCD monitor is designed specifically for the security industry to provide high resolution display of computer signals and/or composite video. Because they consume less power, generate less heat and last longer than conventional CRT monitors, LCD monitors are more cost-effective over long term use. This was a trouble-free installation for BPS, a company with a wealth of expertise and experience in the fire and security industry. Importantly, it has met the client’s exact requirements and specifications and was delivered within the agreed timescales. Peace of mind for the tenants. 24 hour surveillance of the building and car park. Secure environment to live in. Products which are fit for purpose. Honeywell and BPS were able to deliver on all of the critical success factors. Honeywell has a wide portfolio of video products and provides solutions for many applications. The choice of cameras was particularly important. Car parks are prone to cold, damp conditions but are also at risk from vandalism. This made the HD4CHX vandal resistant domes a perfect choice for this application. The relatively new HRDP DVR range has proved to be ideal for Obel delivering straightforward installation and simplicity of operation and providing the facilities team with a 24 hour video monitoring solution which in turn delivers peace of mind and security for Obel residents.